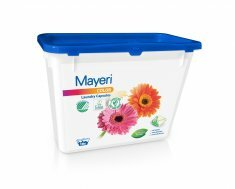 3-compartment laundry liquid capsules Mayeri Color. Suitable for both colored and dark clothes in all types of washing machines. Keeps colors bright longer and protects them from fading. Removes dirt and different stains ( coffee, tea, red wine, fruit juice, tomato puree, mustard, carrot, blood, make up, grass, mud, chocolate) effectively when washing with lukewarm or hot water. Fully soluble, does not leave any residue on laundry or into washing machine. Capsule is covered with water soluble foil , which contains Bitrex ( bitter substance used to avoid children swallowing the capsules). Contains: detergent, stain remover, color protector.